I work 5 days in a week and Saturdays i go for weddings or funerals, i travel for hours and return very exhausted. Sometimes i go home with some office stuff to work on. Now Sunday is the only day i can relax and get ready for the long week ahead, so why should i even go to church when i can worship the same God in my room? after all God is everywhere. This is one of the many reasons why people miss church services. Well, some others say they would not step foot into some church building because people there are hypocrites, unloving, and unfriendly, some even say those who lead worship and chorus leaders always sing boring songs with crooked voices. The talk of bad sound and the quality of instruments as well as instrumentalists are topics for another day. Please you are not a machine, machines do breakdown and undergo maintenance. Rest, even God did that after creation. You must work and rest too but non of those must interfere with your Christian duties as well as your worship. I remember i used to behave this way until i got this revelation which made me realize i am not going to church for human beings but God. If it was to please humans i would not be posting this message to encourage you to start going for God. We all expect the church to be heaven on earth but we go there and what happens is even more than what happens in the world. 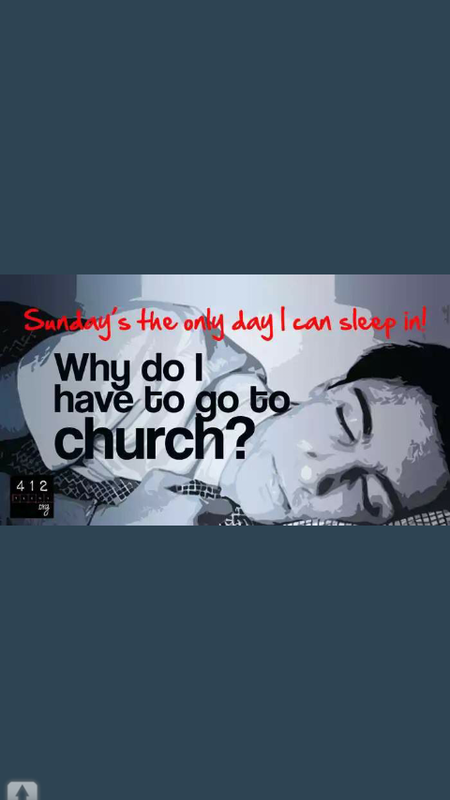 why would you not sleep on a Sunday if you would have to go and the church leader who treated you very bad by refusing you a lift on a rainy day when you stood wet in a queue the other day stands behind the pulpit to preach love! Yes! we all expect the church to be a better place but we should not also forget that human beings make up the church and not Angels and therefore little bites will occur along the way, but the Christ in us should enable us to overlook those things. Running away from your church to another church in view of the fact that your church is made up of hypocrites, forgetting that where you are heading to also is a human institution and they also have their own issues. The somewhat perfect church you see somewhere that you envy and which you wish you were a part of started from quarrels and grew into a matured church. Stop running and be an agent of change wherever you find yourself. It takes only one person to cause a shift in church because that willing person carries God in him and so whatever good cause you have in mind will be established, It would not be easy but with God on your side you will get there. Stop the complains and start praying more and acting on your prayers because what you carry is mighty through God. Start living for God and not yourself because once you live for God you die to yourself daily to be able to fulfill His will daily. It took willing Moses to lead the Israelites from Egypt to the promised land, though he could not enter that land someone took up from where he ended and freedom was given to the people of God. Would you bring liberation to the people of God by being the Moses or Joshua of our time? Father Lord, thank you for this day and this message, i pray that you will forgive me of all the unworthy things done against you, cleanse me oh God, from the crown of my head to the sole of my feet. create in me a clean heart and renew a right spirit within me. Strengthen and quicken my mortal body even as I take up the mantle to cause a shift in my church in the name of Jesus. Thank you Lord for making your ears attent unto my prayers in The name of Jesus have i prayed with thanksgiving Amen. This is a very important subject. Thank you for writing about it. I know many people who have a thousand excuses for why they don’t go to church but when it all comes down to it fellowship with the brothren is a part of fellowship with God. Great post! Great post, The Bible tells us not to forsake gathering together.. especially as the days grow evil.. but satin is so busy dividing the Church..
“It takes only one person to cause a shift in church because that willing person carries God in him and so whatever good cause you have in mind will be established, It would not be easy but with God on your side you will get there. Stop the complains and start praying more and acting on your prayers because what you carry is mighty through God.” WELL SAID !!! A YEAR IN THE BLOGGING COMMUNITY!